Whether an astronaut is heading up to the ISS (International Space Station) or on their way to Mars in a decade’s time, space travel puts crews in an extreme environment with plenty of unique stressors on-board. This can lead to homesickness, isolation, depression, boredom and conflict with other members of the crew. Space flight isn’t just about adventures in sleek rockets – astronauts are humans after all. Although the mental health of astronauts was less of a concern in the early days of the space race, luckily NASA, ESA and space agencies all over the world have been switched onto the toll space flight can take on mental wellbeing since the 1990s. And they need to be. Now NASA plans to send astronauts to Mars by 2030 (or not long after) there’s even more reason to consider the health and wellbeing of the astronauts – a mission to Mars will be longer and more stressful than any other. But how can space agencies ensure the wellbeing of astronauts is prioritised on such high-pressure missions that go where no one has gone before? One way to ensure astronauts are calm under pressure and deal with conflict well is to select the most capable candidates. Many of the people who make it as astronauts have come from roles that are extremely high stress – pilots, physicians, engineers. They’re often chosen because they can handle stressful circumstances and solve problems while under tremendous amounts of pressure. According to a report from the Human Research Program (HRP) at NASA, since 1959 the space agency has carried out intensive psychiatric screening in order to identify signs of mental illness, which could jeopardize a mission’s success. Anyone identified as likely to have a behavioral or psychiatric problem during flight is eliminated from the selection process. This is called the ‘select-out’ process. Conversely, those best-suited to become astronauts are identified, this is called ‘select-in’. In the future, this process could be further streamlined. NASA is currently funding research to find out whether certain biomarkers in a potential astronaut’s body could flag up an increased stress response or whether certain genes could signal disturbed sleep patterns. This means the astronaut selection process may one day involve a DNA test. It’s not just about ensuring individuals are psychologically-sound and well looked after, but how the whole crew works and lives together – especially during long periods of time. This means it’s possible to simulate space missions here on Earth to figure out what causes conflict – and what can be done to prevent it. NASA runs an analogue mission called HERA here on Earth. It involves four astronauts living in a confined space for 45-days to figure out how people are affected by isolation and confinement. Although the missions at HERA have been taking place over four years, researchers from Northwestern University have recently begun to develop a predictive model, which aims to help NASA anticipate problems among crew members. The focus will be on addressing crew compatibility, the events that lead to communication breakdowns, how to work best in teams and designing workflow to keep astronauts engaged. Similarly, the Hawaii Space Exploration Analog and Simulation, or HI-SEAS, runs longer mission simulations for a whole year in a 1,200-square-foot habitat on Hawaii’s Mauna Loa volcano. The fake astronauts live like they’re on Mars. They’re isolated, there’s a delay in communications and they have showers that last seconds – they’re even required to put on spacesuits when they go outside of the airlock. The HI-SEAS researchers have found that most crews end up fighting at some point during the experiment. However, there are also lots of opportunities to analyze why conflict happens and create a better recipe for success in the future. However, these simulated missions have been criticized. It’s hard to say whether the full psychological impact of space travel could ever be replicated here on Earth – all the participants know they’re still on the planet. 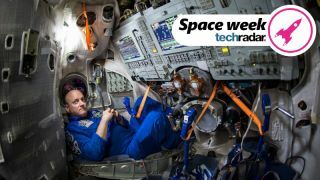 There could be more reason to worry in space, but conversely, stress levels might level off once an astronaut becomes adapted to their new environment and realize they’re in it for the long-haul. Research from NASA suggests that social support is most effective when it matches whatever the astronaut feels stressed about. If there’s a conflict on-board, a conversation with the rest of the crew will help. But if someone is missing their children or spouse, the most comforting thing is to be able to talk directly to them. Luckily, on-board the ISS and other recent missions, the internet protocol (IP) telephone is used regularly to connect astronauts with their friends and family. Many astronauts also find sharing videos, conducting experiments, and making a music video in outer space for social media can also combat feelings of isolation. A tweet may not be the same as an intimate chat with close friends and family, but it fulfils a need to feel connected to Earth and can also provide a greater sense of purpose – they are educating, inspiring and entertaining fans all over the globe. As flights become longer, loneliness and homesickness will likely become more of an issue – especially as there’s a longer delay between communications from Earth, which could be 45 minutes or more than an hour. One option may be to use virtual reality to help astronauts feel calm and more connected to life back home. NASA’s Human Research Program (HRP) suggests adding “virtual windows to actual windows to replace the lost view of Earth” or using VR technology to create environments, along with actual plants, to ground astronauts with familiar, natural scenes. As well as addressing loneliness and providing better connections with life back home, it’s also important that astronauts know how to deal with stress and other conditions that might impair the way they perform and the way they interact with other members of the crew. A current solution on the ISS is private psychological sessions with a psychiatrist, which take place every two weeks for at least 15 minutes. This helps the experts to track any changes to mood or stress levels and recommend steps that can be taken, such as changes to sleep patterns, different kinds of work or more downtime. There’s also research being conducted into tracking the physical symptoms of stress before a problem arises. Researchers at the Florida Polytechnic University are working on what’s been called a ‘happy suit’, which could help astronauts feel better as they travel long distances in space. According to Space.com, the suit is a network of wireless sensors that can respond to an astronaut’s vitals in real-time making adjustments to temperature, light, oxygen levels and more. Arman Sargolzaei, an assistant professor of electrical engineering at the school, said in a statement: "It's vital for astronauts to be mentally healthy during missions and right now there's no active, real-time solution to help them when they feel stressed or anxious [...] This technology would provide them with immediate relief to their state of mind." Other examples of wearable and AI technology could also be adopted in the future, such as biometric sensors that can detect a rise in cortisol or facial recognition technology that can tell when someone’s expression might suggest a stress response. As spaceflight times increase from months to years, researchers expect instances of behavioral and psychiatric problems to increase. After all, a journey to Mars will require crews to live in confined and extreme environments for years – this is a big leap from the six-month duration of lower Earth orbit missions that most astronauts were selected for. A mission to the red planet is also likely to be filled with conflicting emotions. The outbound journey will last months and could be lonely – especially as the communication delay to Earth grows. There might be a lot of excitement about landing on Martian soil, coupled with anxiety about how far from home the crew are. Then there’ll be anticipation about returning home and learning to adjust to normal life again – that’s a lot for even the most level-headed astronaut to deal with. The best solution right now is continued research, more analog studies and an ongoing commitment to consistent care and rigorous processes. That way NASA, and other space agencies can make solid predictions about how crews will fare during longer missions and put all the necessary support structures in place to ensure they’re a success.